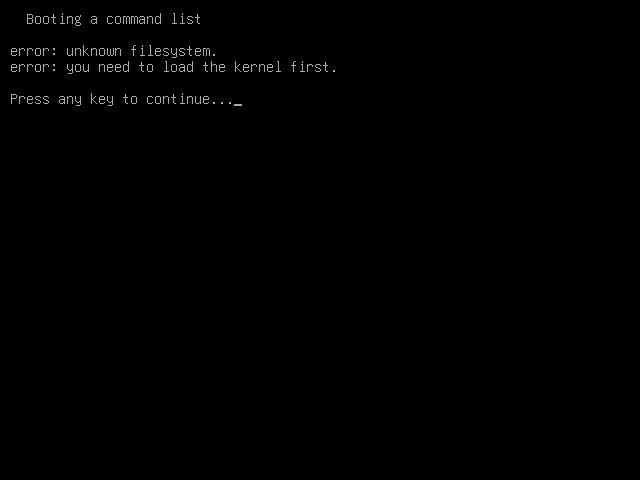 To be clear what I want is a FreeBSD GRUB2 entry that boots FreeBSD on a ZFS (name: zroot) with BIOS firmware (not UEFI). The operating system GRUB is installed on is Arch Linux if it helps, Arch is using a ext4 root, it is FreeBSD that is using ZFS. I've seen this answer but it pertains to FreeBSD on a UFS root, and I've also seen this answer which pertains to Arch Linux on ZFS, not FreeBSD on ZFS. Using FreeBSD's bootloader (which sadly I overrode by installing GRUB to my disk, although it is simple to restore it) I managed to boot my FreeBSD install, so there's nothing wrong with it. I installed FreeBSD and set it up to boot by following what I put in this directory: https://github.com/fusion809/freebsd-scripts/tree/master/zfs-manual-install. To be clear I have tried this successfully, I even tried writing a file and rebooting to check it wasn't just read-only and the file was still there and had not been altered by the reboot in any way (not even its permissions were). Not the answer you're looking for? Browse other questions tagged freebsd grub2 dual-boot zfs or ask your own question. How to adjust TTY terminal window size in VirtualBox? How can i dual-boot FreeBSD and PC-BSD — with GRUB2 in MBR? How to dual boot PC-BSD 10.3 (with zfs file system) and debian 7 (crunchbang) using grub2 boot loader in MBR? Boot Debian and Gentoo with Grub. Kernel Panic!